Peter Martin "P. M." Friesen: minister, educator, and Mennonite historian of South Russia; born 20 April 1849 at Sparrau, Molotschna Mennonite Settlement, South Russia, the eighth of 12 children of Martin Jacob Friesen (17 September 1814, Kurzebrack, Marienwerder, Prussia - 3 November 1883, Halbstadt, Molotschna, South Russia) and Helena (Klaassen) Friesen (1 September 1814, Elbing, Prussia - 1879, Molotschna, South Russia). Peter married Susanna Fast (b. 1854), daughter of Johann Fast and Susanna (Fast) Fast, on 1 September 1873. 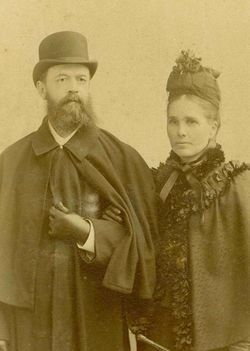 Peter and Susanna had six children: Susanna, Agatha, Hans, Olga, Paul, and Dima. Peter died on 19 October 1914 in Tiege, Molotschna, South Russia. After graduating from the Zentralschule in Halbstadt Peter studied in Switzerland and later in Odessa and Moscow, where he mastered Russian. At the age of 16 he joined the young Mennonite Brethren Church (1866). As a young man he lost his faith under the influences of rationalism, but by God's grace returned to his faith in Christ, and remained faithful to the end. In 1884 he was ordained as a Mennonite Brethren minister. In 1902 he wrote the Confession of Faith of the Mennonite Brethren Church. He had acquired a good theological education. In 1873-1886 Friesen served in the Zentralschule in Halbstadt, enjoying great popularity as teacher and 1880-1886 as principal. Thanks to his efforts, the first teacher training institute among the Mennonites of Russia was opened there in 1878. After leaving the teaching profession in 1886 he spent most of his time in non-Mennonite communities in the Kuban (1886-1888), Odessa, and Moscow. After a serious illness and long convalescence he moved to Sevastopol, where for 13 years he served a Russian evangelical church; and his home was the meeting place for Mennonite students. He served here also as a private tutor. Friesen, however, never lost his love and loyalty to his people. On a number of occasions, because of his command of Russian, he acted as their representative before the Russian Government, fearlessly defending their civil as well as their religious interests. The results of his work on this problem he published in a pamphlet entitled Konfession oder Sekte? Friesen became widely known as a philanthropist and defender of the weak and oppressed, especially during the pogroms against the Jews, and the persecution of the Russian Stundists. His greatest lifework, however, on which he spent 25 years, is the Die Alt-Evangelische Mennonitische Brüderschaft in Russland (1789-1910) im Rahmen der mennonitischen Gesamtgeschichte (Halbstadt, Taurida, 1911). It contains a valuable collection of documents which serves as a source book for much historical research. Friesen finally went to Moscow, where his home became a center for the young Mennonites studying there. His last years he spent in Tiege on the Molotschna; they were saddened by almost total blindness. P. M. Friesen was a gifted and fiery speaker, but not a popular one; his sermons often went over the heads of most of the people. In castigating evil he could be very sharp; he was in general courageous and unafraid. At conferences too he occasionally spoke with vigor. As a preacher he sought to reduce the tensions and bring about cooperation between the Mennonites and Mennonite Brethren, who were sharply opposed to each other in the second half of the century. Braun, P. "Peter Martinovitch Friesen." Mennonite Life 3 (October 1948): 8. Friesen, Peter M. Die Alt-Evangelische Mennonitische Brüderschaft in Russland (1789-1910) im Rahmen der mennonitischen Gesamtgeschichte. Halbstadt: Verlagsgesellschaft "Raduga", 1911. GRANDMA (The Genealogical Registry and Database of Mennonite Ancestry) Database, 7.04 ed. Fresno, CA: " California Mennonite Historical Society, 2013: #274299. Thiessen, F. C. "My Recollections of P. M. Friesen." Mennonite Life 3 (October 1948): 9 f.
Toews, H. P. and Cornelius Krahn. "Friesen, Peter Martin (1849-1914)." Global Anabaptist Mennonite Encyclopedia Online. 1956. Web. 24 Apr 2019. http://gameo.org/index.php?title=Friesen,_Peter_Martin_(1849-1914)&oldid=145185. Toews, H. P. and Cornelius Krahn. (1956). Friesen, Peter Martin (1849-1914). Global Anabaptist Mennonite Encyclopedia Online. Retrieved 24 April 2019, from http://gameo.org/index.php?title=Friesen,_Peter_Martin_(1849-1914)&oldid=145185. Adapted by permission of Herald Press, Harrisonburg, Virginia, from Mennonite Encyclopedia, Vol. 2, pp. 405-406. All rights reserved. This page was last modified on 16 January 2017, at 00:25.